Users depend on architects and engineers (A&Es) to design buildings that best meet their needs. However, many A&Es use specifications from door hardware manufacturers that give away specification writing 'services' for free, raising concerns about unfair influence by manufacturers. In this report, we examine these concerns and evaluate their impact on end users. While A&Es have broad responsibilities when designing buildings, they often lack skills and expertise in niche areas. For example, in a typical project, an A&E firm will design or specify various details including dirtwork, structural building design, plumbing and electrical plans, down to minutiae like placement of soap dispensers and finish paint color. The scope of knowledge demanded is very broad. As a result, many A&Es form relationships with consultants who specialize in particular building aspects. In our market, a section named "Doors and Door Hardware" within CSI 'MasterFormat' Division 8: Openings is one such area where A&Es hire design specialists. A&Es welcome outside help here because the subject is technical and specialized. When door hardware manufacturers volunteer to write this spec, it becomes an opportunity for that manufacturer to fill out a hardware schedule with their own products, regardless if those products represent the best option available for the end user. "The practice of manufacturers writing specifications for architects and engineers is very commonplace in the building construction industry. Most 'hardware consultants' that write door and lock hardware specs for A&Es are employees of manufacturers or commissioned manufacturer's reps. They come to the architect's office, review the drawings, and prepare a complete hardware schedule and hardware specifications - all for free. Most will also provide construction detail drawings at no charge that can be directly inserted into the architect's drawings." Manufacturers are motivated to provide this service for free because it allows them to specify their own products without engaging in a competitive sale. Since building plans and specification sets represent legal contracts, changes or deviations from the listed products are often not accepted. A manufacturer can easily write this specification with 'no substitutions' clauses unless specifically instructed not to do so by the A&E. Even if a specification permits alternatives, detailed specifications may be included by the manufacturer that can only be met with that manufacturer's products. If the specification were written in the 'best interest' of the customer, simple performance criteria of acceptable hardware would be given, e.g: "48 inch, ANSI Grade 1 rated, UL Fire Rated, Non-handed, US32D finish rim exit device". However, condensing that specification to a single sourced product costs this customer a significant premium. For decades, the largest manufacturers in door hardware have directly hired 'subject matter experts' in door hardware (AHCs) to write specifications. Today, it is difficult to find someone with the authorization to write these types of specifications who is not directly employed by a manufacturer, or who otherwise is not incentivized by a manufacturer to write manufacturer exclusive specifications. One such program that is publicly promoted is from leading door hardware manufacturer, Allegion [formerly Ingersoll Rand], called "Write a Spec". Depending on project size, latitude to include IR product, and relationship value of A&E, Allegion writes spec at no cost or charges a nominal fee only to deliver a completed specification. Allegion is not alone in the strategy; their largest competitor, ASSA ABLOY, also has a comprehensive 'Specification Writing Service' that seeks to 'compete' for market share in the same way. The benefit for the manufacturer in the case is that they become the trusted consultant, and the result of their work is nominally reviewed by the A&E who is generally not an expert in this niche. We solicited the thoughts of independent consultants to gauge the depth of the problem. Their feedback was direct and pointed, stating "...A&Es and consultants who use manufacturers to write their specs are abdicating their responsibilities as design professionals", and "There are a few independent hardware consultants out there, but they have a tough time competing with the factory guys who will do the same work for free. Most architects are operating under a tight schedule and budget, and are happy to take advantage of any shortcuts that the manufacturer can provide." The matter of 'fair compensation' also comes into play: When the customer enters into contract with an A&E firm to design a building, the cost of developing a Division 8 section is charged to the customer regardless if the A&E has this portion written for free by the manufacturer or not. Even so called 'independents' often have relationships with manufacturers and may be compensated, including fees that essentially become commissions. To the extent this happens, it might be even worse as the practice is hidden. If A&Es attempt to do it themselves, given their frequent lack of expertise in this domain, they might deliver a bad design that actually hurts their end user. Manufacturer consultants may be incented to specific competitor's products to keep the relationship up with an A&E and to ensure future specification work. When the A&E's elect to 'outsource' specification writing to Manufacturers, end user's best interests can be compromised. 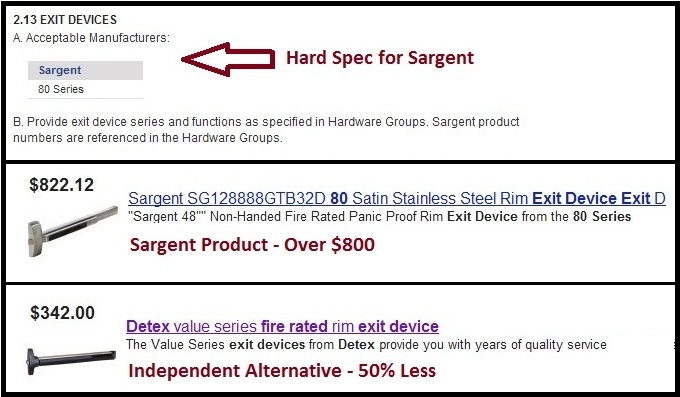 In an effort to manage workload, A&Es can simply find who among the large manufacturers is most willing to write the spec at the lowest price. The A&E becomes a 'middleman' in sharing end user requirements with the spec writers, and they may unwittingly poorly engineer or specify equipment because the manufacturer sees an opportunity to sell product. Ultimately, if end users are fully aware that their A&E is subcontracting out parts of their design to bidders, so be it. However, we suspect that this often is not the case. At the very least, we hope this post helps expose end users to this potential risk.